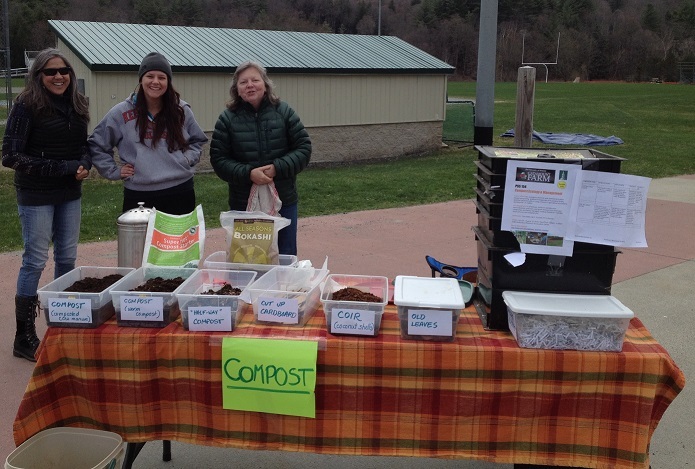 Vikke Jas (r) with her compost display is joined by Dolores Gilbert (l) and Ana Dinatale at a recent Sustainable Woodstock event. Compost refers to a process where waste food and other plant materials are recycled back into the soil. Why is this process so important? It’s good for you. By returning nutrients from plants back into the soil, the nutritional content of your food is maintained. The old adage “Feed the soil, feed yourself” is true: industrial farming strips the minerals and vitamins out of the ground into plant production, but because most industrial farming does not use compost, it does not replenish the soil, making the need for commercial fertilizers necessary. Well composted soil requires no fertilizer, as it supplies everything the plants need to thrive. Soil without healthy microorganisms, minerals and trace elements is plain old dirt and offers no nutrition to growing plants. When a plant is healthy, it passes on appropriate nutrition to you, the consumer. Composting also saves money, by avoiding the cost of fertilizers, and of avoiding the cost of landfilling waste. The average Vermont resident produces 3.08 pounds of food waste everyday. That’s 1,124 pounds a year, or 4,496 pounds for a family of four. All of that useful organic material is going into landfills. Most landfills seal off each layer that is added, denying the food waste access to oxygen. Many food and paper items are still recognizable many years after they are placed in landfills. It’s the law: Act 148 was passed in 2012 to keep materials out of landfills, especially those that can be composted or recycled. Landfill capacity has decreased over the years, and this space needs to be reserved for materials that really don’t have anywhere else to be safely disposed. The Act recognizes that if a compost system isn’t easy to operate, or more expensive than trash, people won’t use it. Landfill bans will be phased in through the year 2020 as infrastructure is designed and built to accept waste from consumers. Diverting food waste at the curb, transfer station, landfill or wherever people dispose of trash needs to be as easy as bagging trash. In addition, the state needs to figure out how to compost such large loads of food waste, including during our long winters. So if you have to sort your food waste in the near future, you may be able to hire someone to haul it away, or even more easily, you can compost it at home in your yard. It can be done cheaply and slowly, or with a little more effort, compost can be made more quickly. Anyone who has left food on the kitchen counter knows that all food will rot. Food waste (minus meat scraps) can be placed in a corner of your yard, covered with soil or leaves to keep pests away, and within a year or so, you’ll have compost which can be used in your yard. This is the no-tech version. Compost can also be made within a month’s time. The recipe is essentially food waste plus moisture plus time and oxygen equals compost. The soil microorganisms need food (food waste), moisture, oxygen, and warmth. When all of these are available, they break down food waste very quickly. The decomposition in most compost piles slows down in the winter but can be prevented by insulating a pile by making it larger, or covering it with other natural materials. In a few year’s time, we’ll be seeing compost collection systems similar to what we currently use in sorting our recyclables. As long as it is easy and cheaper to compost, it will become just another part of handling waste responsibly. Just moved to Quechee from California, where is a good place to compost? Hi Eric, welcome to the area! We will be sending you an email shortly with area compost info. Try the basement! Ten years ago we bought a recycled plastic worm condominium – four circular trays and bucket to catch the compost Tea. It’s not 100%, the worms don’t do citrus or meat but the house plants are very happy and in the summer it goes into the outside gardens. An old Chinese saying goes: the foolish pays to have garbage hauled away, the wise turns it into gold!